Merry Christmas! Happy Holidays! 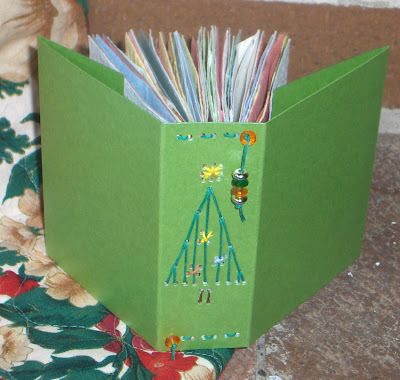 Inspired by the season, I made my Christmas book this past weekend. 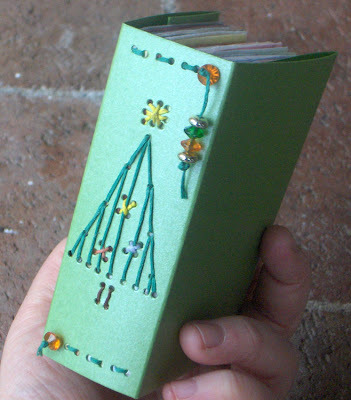 The signatures have been sewn to create the shape of a Christmas Tree on the spine. The cover is some shiny, almost glittery, green cardstock. 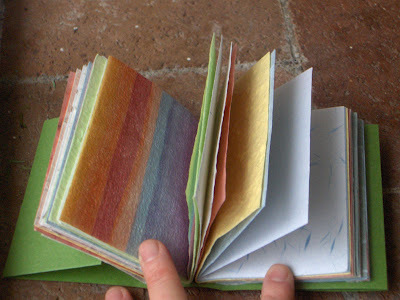 The pages are a mixture of many different handmade papers in a variety of colours. The beginning and the end of the sewing threads have been finished with some little beads for a little extra festive bling. I'm going to list this little book for sale in my Etsy shop, just for one day. If it is still there tomorrow when I get home from my mother's house, then I will keep it for myself! It was a fun little expiriment with the longstitch and I could probably do it a bit better next time....but it'll probably be about a year before I'll want to make another Christmas Tree book! aww what a cute little book! :D and with rainbow paper, whee!